Because no one should dictate what you see. Washington Post reporter Juliet Eilperin leads the pack in this year’s contest for biased climate journalism. Eilperin’s March 10 article entitled, “Carbon Output Must Near Zero To Avert Danger, New Studies Say” has the same sort of journalistic objectivity that one might expect from totalitarian state-controlled media. “Using advanced computer models to factor deep-sea warming and other aspects of the carbon cycle that naturally creates and removes carbon dioxide, the scientists, from countries including the United States, Canada and Germany, are delivering a simple message: The world must bring carbon emissions down to near zero to keep temperatures from rising further,” Eilperin reported. But none of the models in the studies -- nor for that matter any other mathematical model of global climate -- has proven to be particularly useful. No model has been validated against historical climate data. So why would any rational person assume that they can be used to predict future climate or serve as a basis for developing national energy policy? As reported in this column last December, global climate models uniformly predict significantly warmer atmospheric temperatures than have actually occurred. Such model failure should come as no surprise since they have many built-in biases, including the unproven assumption that atmospheric carbon dioxide drives global climate. But all the available real-life data -- including 20th century records and ice core samples stretching back 650,000 years -- fail to support such a cause-and-effect relationship. The ice core samples show, in fact, an opposite relationship. Eilperin, who has long reported on climate for the Washington Post, must know about the models’ problems, but she apparently chooses not to report it. In her March 4 Post article, Eilperin mentioned a report by a number of climate experts from around the world entitled, “Nature Not Human Activity, Rules the Climate.” She even interviewed one of the experts for her story. A section of that report, entitled “Climate Models Are Not Reliable” discusses in plain language how climate models don’t consider solar dimming and brightening, don’t accurately control for clouds, don’t simulate the potential feedback effects of water vapor, don’t explain many features of the Earth’s observed climate, and don’t produce reliable predictions of regional (let alone global) climate change. At JunkScience.com, we label climate modeling as PlayStation® Climatology, with no disrespect intended toward Sony since its PlayStation games are in fact what they purport to be -- just games. Not content with ignoring viewpoints she doesn’t like, Eilperin goes on to diminish, if not ridicule critics of her apparent point of view. Eilperin’s March 4 article featured four ad hominem attacks from three environmental activists, abusing those who question global warming orthodoxy as members of a “flat Earth society” and participants in the “climate equivalent of Custer’s last stand.” If Eilperin wants to poke fun at those who disagree with her on public policy issues, she ought to write an opinion, rather than a news column. 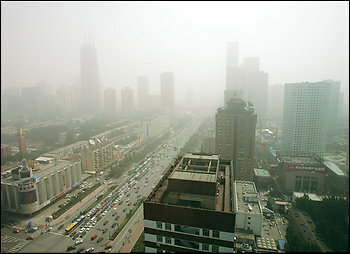 Another disturbing aspect of Eilperin’s article was the accompanying photo of downtown Beijing. The juxtaposition of the article and photo clearly implied that unless we cut carbon dioxide emissions, U.S. cities would soon look like Beijing. But as virtually anyone who breathes knows, carbon dioxide is an invisible gas. Not only can you not see it, there’s no possible way for carbon dioxide emissions to cause smog, haze or whatever was fouling Beijing’s air in the photo. The irrelevant and misleading nature of the photo has been pointed out to Eilperin, Washington Post ombudsman Deborah Howell and the paper’s editors. As of the writing of this column, none have responded and it remains to be seen whether the Washington Post has the journalistic integrity to remove the photo from its web site and publish a correction in its print edition. It’s quite possible that if Eilperin and the many other members of the mainstream media who so far have been in the tank for global warming started reporting on the very real debate about climate model validity rather than simply regurgitating what the agenda-driven modelers tell them, then we could avert the looming national economic disaster that Congress is preparing for the next president to sign into law. JunkScience.com is updated every weekday. Items from the main page are moved to the archives. Links should be good for at least the date posted. After the posting date, link reliability depends on the policy of the linked sites. Some sites require visitors to register before allowing access to articles. Material presented on this page represents the opinion of JunkScience.com. Copyright -- 1996-2008 JunkScience.com, Inc. All rights reserved on original works. Material copyrighted by others is used either with permission or under a claim of "fair use."